You’ve probably never heard of the International Gay Rodeo Association, at least not in the Northeast. Perhaps you know very little about cowboys and cowgirls who happen to be LGBTQ. If so, take the time to get to know them and you’ll enter a special world. Depending on the chapter, there’s also volunteer work, sometimes not having anything to do with issues specific to the LGBTQ community. IGRA promotes the “humane treatment of animals in their housing, feeding, training, exercising and competition,” according to its website. Rodeo competitions are a test of skill, speed and endurance. They include bull riding, drag racing, calf roping, barrel racing, and steer wrestling. Participants are competitive, unpretentious men and women connected to the earth, who purposefully choose one another as family, and have a passionate love for the demanding sport of rodeo. Everyone involved in the competitions wants to win, yet participants or volunteers making the rodeos reality are measured first by the depth and quality of their character. In 1975, Phil Ragsdale conceived of the gay rodeo as a means to support a community-based “Senior Citizens Thanksgiving Feed.” A year later, the first official gay rodeo occurred in Reno, Nev. Today, the 5,000-member non-profit IGRA has 25 local associations throughout North America. Multiple competitions are held during the year culminating in the annual World Gay Rodeo Finals. Gros, who grew up in Tulsa, OK, sees a “spiritual connection for many people involved with rodeo. They are in tune with the rhythms of nature. Animals become part of the family. There is a love for the outdoors, an earthiness.” It helps drive what Gros called “cowboy codes” of “being forthright, giving value for labor, and dealing directly and honestly” with one another. The cowboy and cowgirl code includes a hospitality where everyone is welcome including straight folks and transgender people. IGRA chapters take on a variety of volunteer projects, from spending time with autistic children, to adopting a park, to raising funds for cancer support services and research, to staffing homeless shelters and facilities that work with LGBTQ youth. IGRA’s “Royalty” program and its philanthropic foundation also play a key role in helping raise money. IGRA Royalty is composed of 10 men and women who perform in drag shows, horsemanship events, and public presentation and entertainment activities. 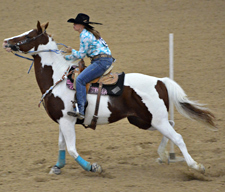 They raise awareness about their code, LGBTQ rodeo history, and the association’s various charitable initiatives. Members of the Royalty program typically dress in “western wear,” a style rooted in the Old West of the 19th century that can be formal or informal. Outfits can consist of a denim jacket with leather fringes, or jeans, t-shirt, and big-brimmed, high-crowned hat, or boots, denim jacket, and fancy dress shirt. Patrick Hunter, a Boston native and president of the Atlantic chapter of IGRA, said he values the camaraderie of rodeo lifestyle. According to Hunter, IGRA is “breaking stereotypes. It’s moving beyond them to show rodeo is another sport.” Hunter added that he didn’t know how to ride bulls or western dance until joining the IGRA. (Note: Western dance has many forms and includes the polka, square dance, the promenade, and the 10-step. It is set to country-western music). IGRA is helping to change the world by being a safe haven for those needing a place to be accepted and by leading through examples of kind acts and by members being themselves and living the cowboy and cowgirl code. Even members of the transgender community are welcomed with open arms and non-judgement. Gardner said, “The LGBT community is not always as accepting as we’d like to think. [Collectively as LGBTQ people] we are out and vocal, but when it comes [specifically] to transgender men and women, we are left out. Gender is not as binary as society makes it. To others, the cowboy lifestyle means living according a code of civility, honesty, and fraternity. “Our community needs people who care. I don’t talk about the cowboy code. I live it,” said Wade Earp, a Texan with a distinguished western lineage and the winner of dozens of competitions. In 2015, he was inducted into IGRA’s Hall of Fame. Char Duran, an active member of the IGRA’s Colorado chapter, averages about four competitions a year showing her skills in calf roping and bull and steer riding. She attended her first IGRA event more than 20 years ago as a spectator. She immediately realized IGRA enthusiastically encourages women to compete, which is often in sharp contrast to straight rodeo. It wasn’t long thereafter that she was volunteering and developing a deeper bond with the land and its animals through volunteering and eventually as a competitor. “Rodeo is about skill and how well you control your performance in the moment. The competition is within in yourself,” she said. “I control how well I ride and perform.” This is a sport requiring focus, discipline, determination, and respect for the animals. Rodeo also has given Char a joy positively and profoundly impacting everything in her life and how she sees the world. Although Char doesn’t identify as a role model, she does acknowledge she and other women are setting an example not to be afraid to try. Independent of the fun, sportsmanship, and genuine sense of family, there is a very serious element to IGRA Char underscored several times. Be the first to comment on "NEPG: LGBTQ Cowboys and Cowgirls — Kind, Tough, Grounded, Down-to-Earth"